Enabling remote and local access control for your APC NetShelter SX enclosures thus protecting IT assets from physical threats within your Data Centres, Server Rooms and Communication Rooms. Network appliances enabling remote or local access monitoring and control for your APC NetShelter SX enclosures. 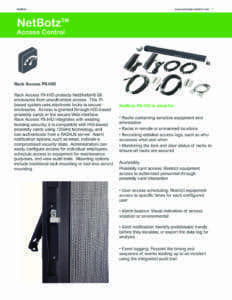 APC Rack Access Control uses the NetBotz 250 appliance plus a handle kit to enable remote lock/unlock capabilities and badge access privileges for IT enclosures. The appliance can be mounted in a 0U or 1U configuration and is designed to work with APC NetShelter SX racks. Access is granted through the use of proximity cards or a Web interface. Administrators can easily configure access control profiles for individual employees, configure scheduled access to equipment for maintenance purposes, and view audit trails. Various alarm notifications are available to indicate a compromised security state such as forced entry and door position. This system integrates with NetBotz Devices and Schneider Electric’s Data Center Expert. 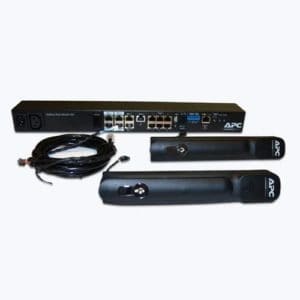 To find out more about APC NetBotz contact us.